It’s been a minute since I’ve spoken with you all via The Trek, but I wanted to come at you with some motivation for this lovely Monday. Or Tuesday, Wednesday, Thursday.. Whatever day you decide to read this. It’s been over 5 months since I returned home from my incredible journey on the Appalachian Trail. I’ve almost been home for the same amount of time that I was in the woods.. Which is a crazy thing to think about in itself. I’ve taken a good bit of time over the past 5 months to reflect on how I have changed, what I have learned, and how I want to continue to change. I don’t think being off the trail has gotten any easier, but what I have learned to do is embrace how that segment of life’s journey has come to a close, but that does not mean the adventure has come to an end. My walk on the Appalachian Trail was not a “once in a lifetime opportunity.” It was only the beginning of opportunity that I have opened up for myself. I will continue to live my life seeking change, growing, learning, and planning for the next adventure. As I reflect on who I was prior to the AT and who I am now, I want to share a few of my thoughts with you. Prior to the trail, I had so much hatred built up at myself for how I looked, felt, and thought. I used to try my best to cover up how truly upset I was with myself. Those thoughts were reasoning for departing on the trail in the first place.. I wanted to spend time thinking about who I was, who I wanted to be, and how I was going to make major changes in my life. I stepped foot on a trail not only to explore but to grow. And let me tell you, the impact and experience was more than I could have ever hoped for. Below is a before and after photo of myself. 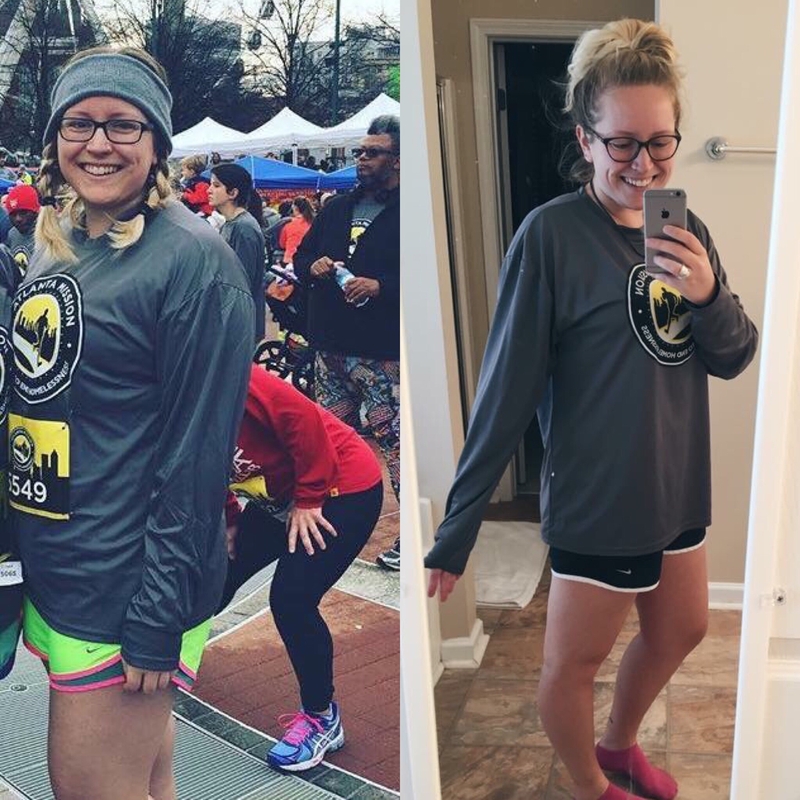 Before the trail, I ran a 5k race and felt so incredibly insecure with myself. 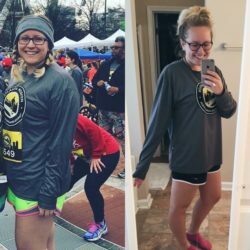 After the trail, I ran a half marathon with immense confidence and love for myself. My physical appearance is not the most shocking change. Going from 210 pounds to 150 pounds is not the change I want to focus on. I want you to think about the mental aspect to hiking the trail that I mentioned quite a bit while I was out there.. Well, the mental aspect to everyday life is just as difficult. Sometimes I’ll let my own thoughts take over and speak negatively over my life. I should probably write that in past tense because that isn’t the case anymore. The trail taught me how I am the only person who can change the way I think. I’m the only person who can change the way I live. And that’s exactly what I’ve done. I live my life with the most positive mental attitude, I fuel my body with foods that make me feel good, and I listen to my body while taking care of it. Inevitably, my body has followed my mind. Positive thoughts, motives, and intentions have led to positive changes in my body and mind. With all of that being said, I also want to shed light on the fact that me writing about this is much easier than actually doing it. I wake up everyday and choose to make the best of what is to come. Some days are incredibly difficult. Some days I just want to lay in bed all day. But those days are heavily outweighed by the wonderful days where I feel confident and free. It was the same while on trail.. The good days outnumbered the bad days. The bad days made the good days that much sweeter. I’ve translated that important lesson from the trail to my daily life. I’m preparing and planning for this summer’s adventures. I plan to hike the Colorado Trail and Long Trail of Vermont. I hope you all will follow along. If you’re interested in reading short essays I write, I often post them as captions to my Instagram (@ashschellhase) posts. They are intended to help you better understand my life journey. But more importantly, they are to spread positive and unique thoughts. Most of the time, I write them directed at myself. I use words and language to inspire myself, to keep myself on track, to remind myself why I’m choosing this lifestyle. Maybe my words could spark something within you, maybe they could make you giggle, or maybe you’ll be annoyed by my wordy posts.. But regardless, I invite you to read with me, respond, start a conversation, constructively criticize me.. What have you. I’ve essentially chosen to open up my life with strangers in hopes of not only personal gain but to interact with others. If you want to change something about yourself or your life, go do it. Don’t let anyone stop you.. including yourself.